Moodle is a great open source and freely available online learning management system, but what really makes it special is the large community of teachers and administrators that are using it in many different and innovative ways. And that is why Moodle conferences called MoodleMoots (gatherings of wise Moodle users) are always great events to attend for anyone already using Moodle or trying to learn more about it. They are a great opportunity for people to share best practices and to find new connections and even friendships. 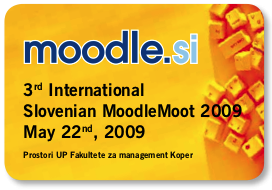 And it is with great pleasure that I’m now helping organize the 3rd International Slovenian MoodleMoot, which will take place on May 22nd in the lovely and sunny coastal city of Koper, Slovenia (my birth place!). I would like to invite you all to attend our Moot and present your experience with Moodle; and if you can’t make the trip to Koper, you can even present remotely via Skype. If you’d like to learn more about our MoodleMoot, see the official Call for International Presentations. P.S. : Speaking of great conferences… don’t miss The Virtual World Best Practices in Education (VWBPE) conference this weekend (March 27-29) - it’s a free conference taking place in the virtual world of Second Life.